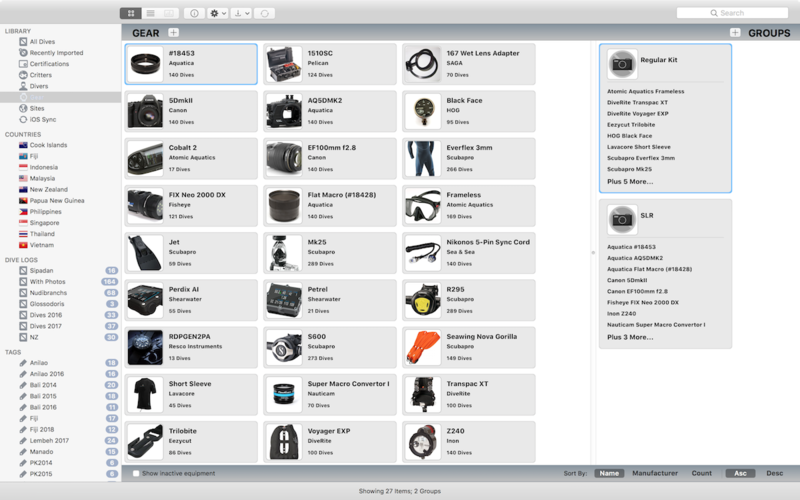 Selecting Gear from the Sidebar lets you view and manage your diving equipment. Gear is split in to two sections - Gear, and Groups. Gear lets you create and manage your diving equipment. Groups lets you organise your Gear in to convenient Groups to make managing them easier. You can view your Gear in two ways. Either as a set of Thumbnails (pictured above), or as a simple List. Use the Toolbar to toggle the View mode. From elsewhere in the application, you can choose New Piece Of Gear from the Quick Action Menu (see Toolbar). If you are using the Thumbnail view you can also click the "+" icon at the top, to create either a piece of gear or a group. The Gear Inspector, much like the Dive Inspector, lets you view and edit single or multiple pieces of gear. 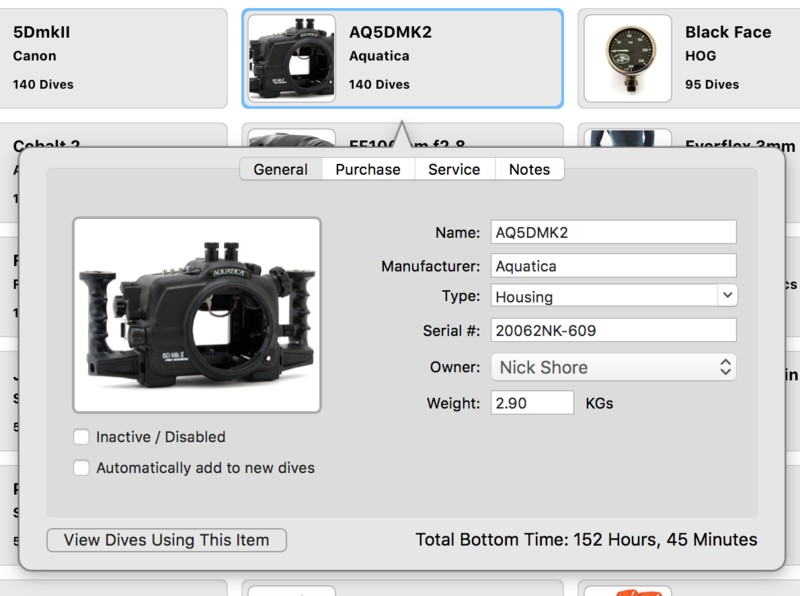 When viewing Gear, you can bring up the inspector using the same methods as the Dive Inspector. In both the Thumbnail and List views you can also double-click on a piece of Gear to bring it up. List View lets you select multiple pieces of gear to edit in one go - great for making bulk changes. You can manually assign gear to dives with drag and drop via the Dive Inspector. You can also check Automatically add to new dives from the Gear Inspector to have a piece of gear get added to every new dive. You can disable pieces of gear via the Gear Inspector. This indicates they are old or unused, or perhaps rental items or things you borrowed. You can use this to filter them out of the main Gear view or to avoid them being shown in the Dive Inspector when you're adding gear to your dives.